This Quoizel Alcott Mission style 2 light Tiffany table lamp with valiant bronze finish base boasts shades of cream, amber and green art glass in a geometric pattern. Featuring a 49cm (20″) circular shade, inlaid with strips of amber cream glass that radiate from the centre to the rim and decorated with dark amber rippled glass. An iridescent green glass border decorates the circumference and glitters like a jewel when illuminated. The Alcott features Mission style at its finest. The beautiful shade is artfully arranged and features a soft green striped accent and the classic column base is finished in valiant bronze and fitted with two pull chain switches for convenience and flexibility. An exquisite design, handmade by skilled artisans using 320 individual pieces of art glass which are copper foiled and hand-soldered to create this stunning shade. The hand-crafted Tiffany style shade features a classic design, with a beautiful colour palette which creates a warm and inviting atmosphere. The chestnut bronze finish adds to the authentic look and make it ideal for both traditional or contemporary style rooms. 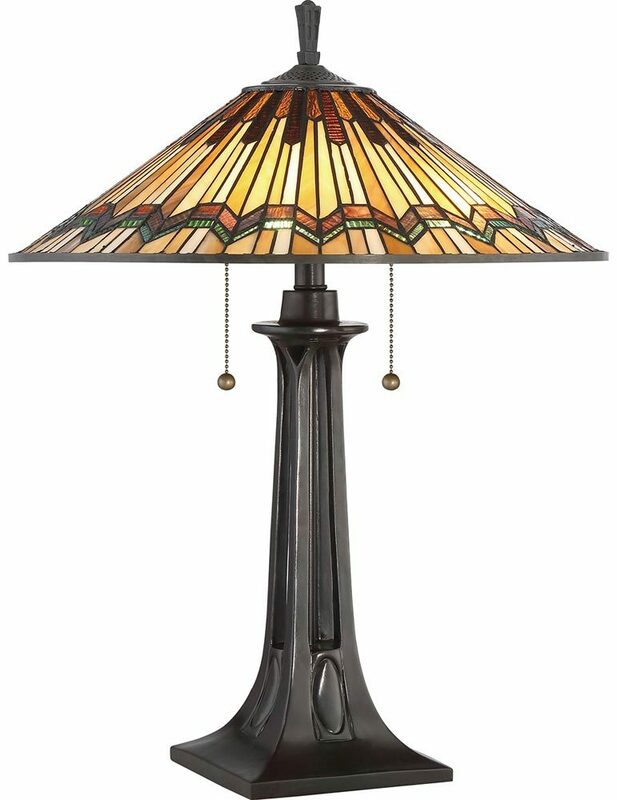 This is a hand-crafted Tiffany style table lamp, soldered using traditional techniques that have been used for centuries. The shade colours may differ slightly from the image shown as each piece of glass is hand-made and may differ slightly in hue or shade. This should not be seen as a fault, rather something that makes each Tiffany shade unique. This stunning design is supplied by Elstead Lighting and designed in the USA by Quoizel, founded in 1930 in New York. Their designs embody a history of being artisans in glass and natural materials that illuminate your living space and enhance the beauty of your home, such as the Alcott Mission style 2 light Tiffany table lamp with valiant bronze finish base featured here.